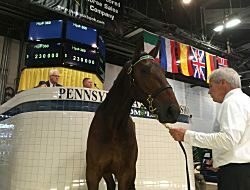 Harrisburg, PA —- Ken Jacobs arrived at Tuesday’s second session of the Standardbred Horse Sale with the intention of buying one horse. He departed several hours later with his objective fulfilled. 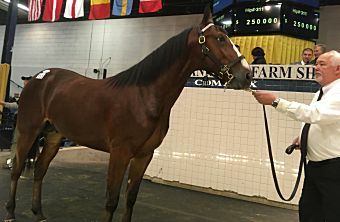 Jacobs bought pacing colt Rodeo Blue Chip, out of the family of his Dan Patch Award-winning Heston Blue Chip, for $250,000. The price topped the 303 yearlings sold on Day 2. 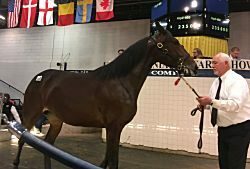 Rodeo Blue Chip brought a winning bid of $250,000 to top the second session of the Standardbred Horse Sale. “I was going to get him,” Jacobs said. “He looked good. He looked a lot like (Heston Blue Chip). I didn’t think I would have to pay that much, but if you’ve got one guy who likes him beside yourself, you’re going to pay. Linda Toscano will train Rodeo Blue Chip. The colt was among three yearlings to sell for at least $235,000 on Tuesday. Last year, the second session’s top-seller went for $180,000. Through two sessions this year, a total of 473 horses sold for $27.99 million. The average of $59,182 was 11.9 percent better than last year’s $52,847 for 483 horses ($25.5 million gross). On Tuesday, 19 horses sold for at least six figures, which was an increase of two from 2017. Rodeo Blue Chip is by Sweet Lou out of Lotsa Matzah and his family also includes millionaire Sunfire Blue Chip and Dan Patch Award-winner Kikikatie. He was bred by Blue Chip Bloodstock, Daniel Zucker, Christine Sallee, and Stephen Demeter. The colt was consigned by Blue Chip Farms. Following Rodeo Blue Chip on the top-sellers list were Chapter Seven-sired trotting colt Third Shift and Muscle Hill-sired trotting filly Hilly Holbrook. Both yearlings sold for $235,000. Third Shift was purchased by trainer Ake Svanstedt for $235,000. Third Shift was purchased by trainer Ake Svanstedt. The colt, bred and consigned by Winbak Farm, is out of the mare Overnight Command. Hilly Holbrook was purchased by trainer Julie Miller for a group headed by Marvin Katz. Also in the partnership are Brixton Medical and Bud Hatfield. The filly is out of the mare Winky Dink, from the family of Dan Patch Award-winner Winky’s Goal. She was bred by Julie Meirs and consigned by Concord Stud Farm. Hilly Holbrook was purchased by trainer Julie Miller for a group headed by Marvin Katz. USTA/Ken Weingartner photos. Rounding out the top five Tuesday were Chapter Seven-sired trotting filly Robin Blue Chip and Andover Hall-sired trotting colt Amstel Hanover. Robin Blue Chip, out of the Swedish-bred mare Richesse Oblige, sold for $175,000 to trainer Per Engblom for a yet-to-be-completed partnership. She was bred by Blue Chip Bloodstock, Herbert Burns III, and Jacob Kiefer and consigned by Blue Chip Farms. Amstel Hanover, out of the mare Angel Pie from the family of Hambletonian champion American Winner, sold for $170,000 to agent Lina Alm. The colt was bred and consigned by Hanover Shoe Farms. Through two days, trotting fillies led the sale with an average of $67,570 for 100 yearlings sold. Pacing colts were next with an average of $64,254 for 138 sold followed by trotting colts at $58,529 for 104 and pacing fillies at $47,954 for 131. Muscle Hill led trotting stallions with an average of $178,938 for 16 yearlings sold while Captaintreacherous led pacing stallions with an average of $84,146 for 41. The yearling portion of the Standardbred Horse Sale concludes Wednesday. The final session begins at 10 a.m. (EST) at the Pennsylvania State Farm Show Complex. For complete results, visit The Black Book.